If you’ve played a few of Telltale’s episodic adventures by now, you’ll know that a) they’re very good at applying the rules and stylings of other licenses to their own game in order to create a new experience that feels faithful to its source material, and b) they’ve figured out a bit of a template for all series to help them do so. Telltale got you hankering after the real thing? Check out our 50 best Minecraft seeds. 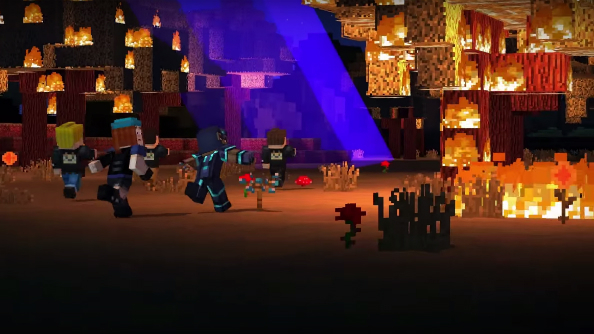 Minecraft: Story Mode does bear some marks of that template – characters will ‘remember that,’ big choices are presented in that familiar ‘left or right?’ fashion – but in many ways, it also feels further out of Telltale’s comfort zone than any of its myriad other series. For starters, it’s set in a world that, until now, had no characters or dialogue at all. It’s a big ask of a videogame writer to develop relatable and endearing characters from an IP whose social interactions extend only as far as slapping a pig into pork chops. Until you bring co-op into the equation, at least. In fact, Minecraft’s culture of co-op play and building collectives seems to be the chief informer of Story Mode’s characters. 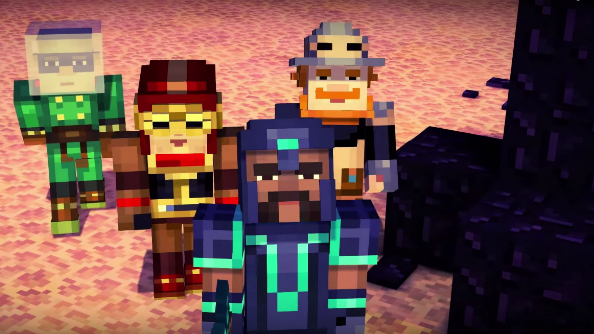 Lead character Jesse, playable as a male or female for the first time in a Telltale series, and friends Olivia and Axel, exist as player avatars within a Minecraft game. The trickier metaphysical question of whether they also exist as human beings outside the game, and thus the voices you’re hearing are them conversing via Skype, remain unanswered. I’m going with probably not. Jesse (I opted for the male flavour, voiced by Patton Oswalt) and the gang are excitedly preparing for an upcoming convention in which they’ll demonstrate their blossoming building expertise – Jesse in particular is still a bit of a noob. Facing off against them at BuildCon are a gang of cocksure leather jacket-wearing builders who, it seems, beat Jesse’s gang every year. Not with all that much grace, either. It’s here, early doors, that Story Mode demonstrates its Pixar aspirations. Dialogue is breezy and knowing, layered for an all-ages audience. A strong sense of wholesome morality informs the cast: Jesse isn’t the best builder, but he’s the most passionate, and believes anything’s possible with teamwork, friendship, belief, montages… you get it. Did I mention he has a pet pig, too? No? Okay, he totally has a pet pig, whose inability to converse and emotive facial expressions tick another animated kids’ movie box. But there’s a darker, sassier side to Story mode, too. Telltale’s creative communications manager Laura Perusco tells me that Pixar was indeed a key source of inspiration – among the likes of Ghostbusters and The Goonies. Movies aimed not specifically at children, but intended for young and old to watch together. However, the game carries a certificate 12 rating, which means in the eyes of the law it isn’t intended for the very young and old to watch together. Personally, I found nothing in Story Mode’s first episode that demonstrated a clear need for that rating – I reckon an 11-year-old can handle a Wither attack and someone saying “crap” – but then I’m not a parent. Mechanically, you know the drill by now. Anything happening at pace is controlled via QTEs, conversations have multiple dialogue options that carry consequences in terms of how characters perceive you later on, and there’s a light inventory element that informs some basic puzzles. The difference in this series is that there’s also a crafting system, which works more or less exactly like Minecraft’s own – a 9×9 grid onto which you place materials to make weapons and items. If you’ve played even a few hours of Mojang’s game, you don’t even have to look at the recipe book to know where to place those sticks and lump of stone to make a sword. Hammering a QTE occasionally initiates an ultra-gratifying super-speed building sequence, in which Jesse and his compadres might fling up a treehouse or an exhibit for the convention. You might not be placing the blocks per se, but for an episodic adventure game it does an admirable job of making you feel like you are. 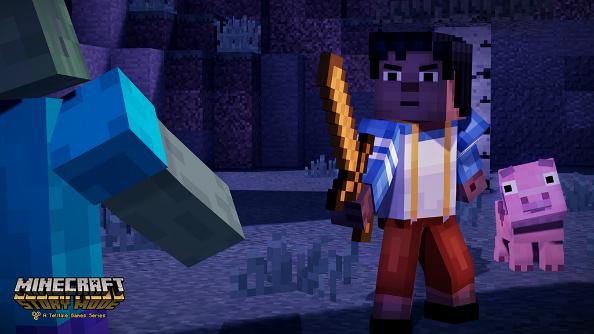 Building and crafting are accounted for, then, but Story Mode’s authenticity to Minecraft goes deeper than that. There’s a tremendous tranche of humour that Telltale have found by simply being faithful to the original game: watching lava flow in that instantly recognisable and comedically slow pace while those around flee in terror, for example. Or simply watching someone punch a tree as part of a building montage. Said lava is only the beginning of episode one’s perils. Jesse & co’s adventures take them in search of The Order of the Stone, four legendary builders who might be the world’s only hope against an increasingly OP’d Wither. After a relatively pleasant opening jaunt around the grounds of BuildCon, you find yourself navigating the Nether itself before this first ep’s credits roll. More well-paced escalation from a studio who has it down pat by now, having ironed out the kinks in The Walking Dead, The Wolf Among Us, Tales From The Borderlands, Game of Thrones, and probably a dozen other series I’m forgetting. But I said this was a big departure from the familiar Telltale episodic experience, didn’t I? And I meant it. Not least because your experience of episode two may be completely and utterly different to mine, not just in terms of the character we chose at the beginning, but in the consequences of our big final act choice leading us down completely separate paths. The visuals help, of course. Previously, Telltale’s output has been unified by a quasi-cel-shaded look that Borderlands happened to fall in line with by chance, but here the Minecraft aesthetic is recreated 1:1. The team even went to the trouble of building environments in Minecraft first before importing them over into Telltae’s engine, for maximum authenticity. The resulting architecture is genuinely stop-and-stare impressive. If that might sound prohibitive in terms of character expressions and subsequent emoting, the star-studded voice cast do their bit to overcome the limitations of their pixellated visages. I can only comment on Patton Oswalt’s take on Jesse since I picked him over Catherine Taber’s. Sorry Catherine. What I can say, though, is that he’s immediately engaging, as are Ashley Johnson as headstrong mercenary Petra, Brian Posehn as the surprisingly complex Axel, and Dave Fennoy as Gabriel the Warrior, returning to Telltale after a genre-defining turn as Lee Everett in TWD Season One. 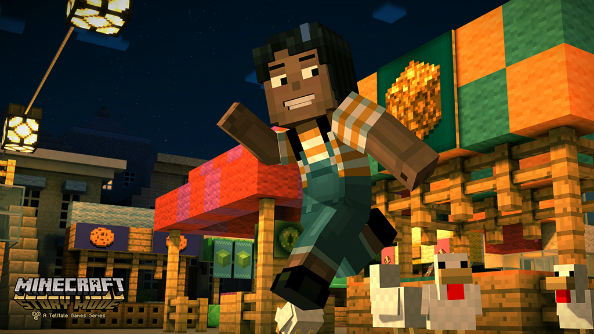 Coupled with a new bright-eyed, all-ages tone and hands-on mechanics such as crafting, it feels like Minecraft Story Mode exists on its own two feet, and has been given the freedom by both Mojang and Telltale to discover its own character. Somehow, Telltale is able to take on an ever-expanding list of projects without ever appearing stretched or showing signs of dropping their standards. 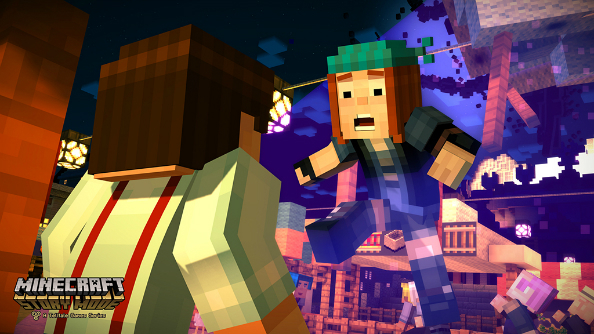 Minecraft Story Mode’s first episode doesn’t show signs of taking on TWD for sheer emotion or topping TWAU’s storytelling, but then you wouldn’t really expect it to, would you? No, instead it’s shaping up to be a fantastic companion piece to the game it’s obviously studied to thoroughly.